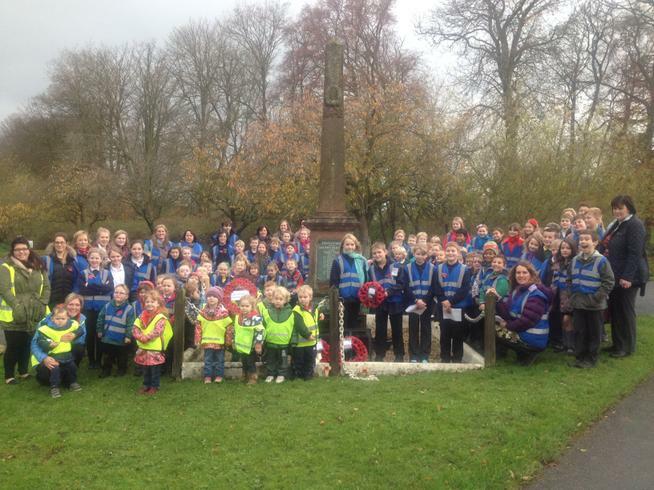 On Tuesday 11th November Warcop CE Primary School took part in a Remembrance Activity Day. It started with a story from Andrew Wright, a parent governor, who told the children about how a bible from his great grandfather, Albert Bann, had been traced back to him almost 100 years after it first went missing in action. At eleven o'clock the school joined the onsite Nursery; Red Squirrels to walk into Warcop to have a service beside the memorial. A wreath for the Nursery was laid by Haylen, and Layla and one from the school by James and Molly. The service included prayers written by Jonathan and Eleanor. The children paid respect and held a two minutes silence while listening to " The Last Post". The day continued with a carousel of activities prepared by the teachers, including learning about war hero and professional footballer Walter Tull, a session exploring the significance of the poppy, creating silhouette pictures of the London skyline and creating a medal, similar to what a soldier would have received. The day finished with an assembly where school cleaner and ex-military serviceman Rory Robinson explained to the children what he felt it meant to serve your country in a combat situation. He also presented the school with his treasured beret from his time with the military. Staff and Children alike both commented on how moving the day was and how it was nice to commemorate the 100 year anniversary of the start of World War 1 in such a way. Go to Children > Gallery > Remembrance Day 2014 for more details and information.